I've been busy this week putting together a website for my pseudonym, Serena Lake. A few months ago when I bought my domain name, I also bought one for Serena. The intention was to create a website for her in the Autumn, but something has been telling me to get it done now. I've learnt that it's advisable to listen (and action) those instinct alerts, because when I ignore them I quickly find out that it was the wrong thing to do. I'm going to continue the Carol's Corner blog covering my writing, research and the news about competitions and other literature related items- that I sometimes venture into talking about. But while I may also talk about history related items here, I'll perhaps give a different slant or more detail on Serena's blog. 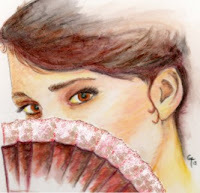 Serena's blog on the website will concentrate only the historical romance side of my writing- and reading. I may even share opinions of research books and useful websites. I'm on the final adjustments now, and as soon as I'm happy I will get my domain transferred, and begin blogging. And of course let everyone know it's officially launched. Making the website has taken a lot of thought as I had to decide what image I wanted to suggest by my choices of design, colour and pages, as well as their content. I'm going to let you have a quick look at the website before it is finalised- still trying to work out the contact options so that's still missing, but otherwise it's 90% there. I'll be expanding pages when needed, and adding social media links. So if you want a quick peek, then follow this link. I had just typed a well-thought-out comment and my damn laptop decided to restart! What I think I said was that Serena's site looks good but you might want to insert a space either side of the dash in the heading; Serena Lake-writer looks like a hyphenated word. Good luck with keeping two blogs going! I love Serena's page and the photograph is thought provoking. Wishing you lots of fun with that, Carol. I look forward to checking it out when it's full operational. Have a lovely weekend. It makes sense to get these things set up before you really need them, rather than having to rush them through when you're busy with something else or have a deadline. Thanks, Lizy, adjustment done, and it looks better. The hallway picture is wonderful, and was part of the chosen theme that I began with. It suggested history and so much more. Are you transferring this blog to your new (own) website? I'm planning to do that with mine, if it's possible, and wondered how you got on? Good luck with the Serena Lake one - looks interesting and attractive. Always trust your instincts, Carol! Love the new website and the photo with the fan. Will look out for posts. No I will be keeping this one running, as I have flash fiction published under my own name, and I'll be using it for any contemporary stories that may get published. I know you can export content from a blogger blog to Wordpress though haven't tried it myself. Good luck with it. I'd intended to do the website last year, but just didn't have the time, so put it on this year's to do list. It's been easier to put together than I expected, and I can expand it in future when needed.